Here we look at some of the applications of IGC. “God made the bulk; surfaces were invented by the devil” this quote from Wolfgang Pauli (Nobel Prize for Physics) nicely illustrates the difficulty of surfaces. The chemical composition alone is not enough to describe the interaction with the surrounding media. The physicochemical properties are determined significantly by the orientation of outmost molecules, some high-energy sites and additives in tiny amounts. And this determines finally the real application behaviour. Do the pigments disperse well? Why does a different milling process change the properties of the excipient? IGC is especially well suited to detect and quantify the real surface interactions. Well defined gas molecules are used as probes. And the results as surface energy or specific interaction parameters serve to describe and predict the behaviour in gas phase and very often in liquid phase too. 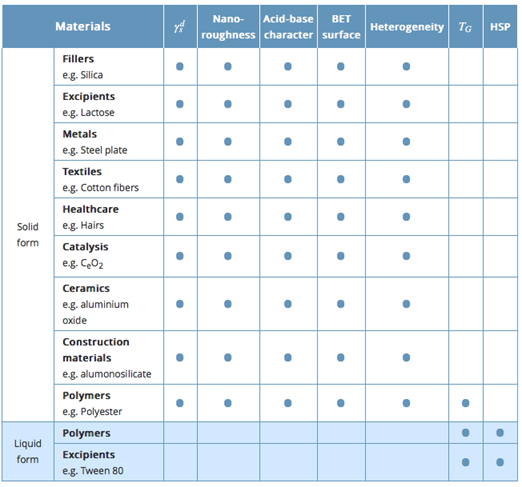 The table gives an overview of the application fields and materials. Two reviews, the latest from year 2014, provide further descriptions and numerous references. Basically, these are all applications in which a well-defined physicochemical characterization of the surface supports the understanding and the product development.